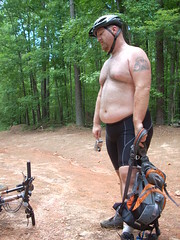 Mountain biking at new light - To grrr, or not to grrr? That is the question. Normally swindunbar, Dana and I hit the trails on some simple stuff. 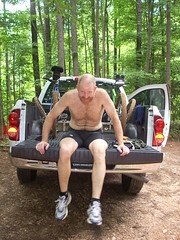 Today we did something else new and headed up to New Light which is north of Raleigh near Hwy 98. Let me just say this trail completely KICKED OUR ASSES. This was close to one of the worst times to hit this trail and we paid for it. We get there around 0900 and the fog is still settled in, so the humidity is already 100%. It looked damp and we knew there was some rain earlier last night, but it only looked like that on the surface. We get geared up and hit the trail. It's very wet, damp, no wind, lots of wet rocks, lots of wet roots and tons of hills up and down all over the place. With the humidity and already warm temps it was easy for me to overheat and had to take it easy especially on the short climbs. It's been months since I've been on this trail and I forgot how technical it was. There is a massive hill about 2.5 miles in and that just wiped me out. I had to stop for several minutes to get my heart rate back down. We ran into a cute fellow by the name of Josh who biked with us for some time, but he eventually moved on as he was on a tight schedule. At this point I was getting exhausted and so were the others. We really wanted this trail to end, but we had many more miles to go (and no shortcuts to get out). We were so done. Exhausted, dehydrated, muddy, sweaty..., poke a fork in us, we were done. No energy. 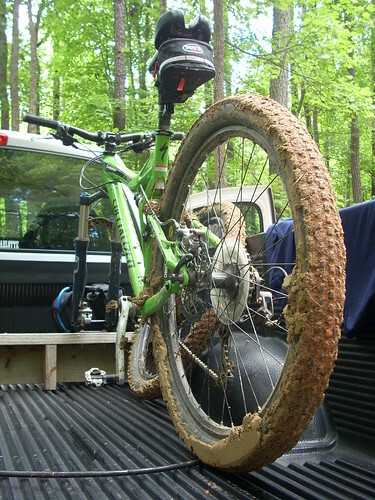 So, we have to remember to only ride this when it is dry and under much better weather conditions. You guys are STEELY EYED MISSLE MEN. RAH! Inspiring! Hehehe, well, I don't know about that, but thanks! Oh, it was. We're still trying to find the truck that ran us over. I figured it might. :) We do have all kinds of trail down here. You warsh the mud offa that bicycle RIGHT NOW, MISTER! Don't you go trying to take that across my new carpet! And that large man is CUTE. Yep, that was the next thing I had to do when I got home--clean the bike. That was not fun in that heat outside. That's awesome. I've never really done many trails with all the riding I've done. I'm a little too used to road riding with my mountain bike. I'm sure you guys would wear me out!!! Blasphemy! Using a mountain bike as a road bike?!? Well sometimes I would rather just ride from my house without loading my bike into my truck. Plus this is Houston. Not very many trails that I'm aware of. Well, I don't know what you've got there. 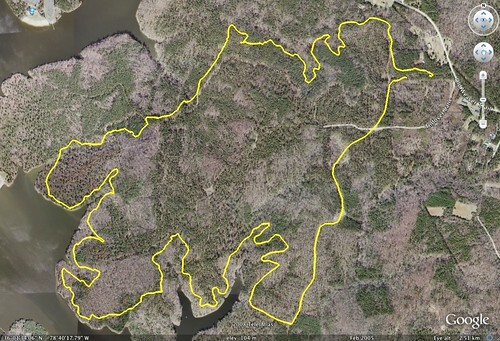 My friend Owen in Dallas has some really great trails out his way. Feel free to swipe it if you like. I just found it online and loved it!